But leave them at home – if you know where to look, Hungary is a secret garden of healing and wellness. The Romans were the first to fall in love with Hungary, but certainly not the last… It is said that wherever they went, they built, and where they built, they bathed. They knew of salus per aquam (“healing by water”) and made maximum use of this natural treasure. More than two millennia have passed, but the thermal water is showing no sign of running dry. Today's uses of the therapeutic water bear little resemblance to those of the Roman Empire. Thermal water is now recommended for a wide variety of conditions, from the scourge of the modern age, stress, to joint pain and gynaecological or skin complaints. Whatever the ailment, Hungary's healing garden has just the cure. Patients are spoilt for choice not only in terms of the wide range of wellness spas and resorts equipped according to the highest medical standards, but also when it comes to accommodation – there is something for all tastes and budgets. Whether you chose one of the famous cities, such as Budapest, Eger, Esztergom, Szeged or Visegrád, the opulent vineyards of Transdanubia, or the holiday capital of Lake Balaton, there is something for everyone. The River Danube once formed the eastern boundary of the Roman Empire – the area today known as Transdanubia was at that time the province of Pannonia. Its capital was Aquincum (from the Latin aqua, meaning water) in what is now Budapest. Archaeologists have unearthed 21 Roman baths in this area: remains of fine mosaics remind us that bathing has been part of this region’s culture for over 2,000 years. Hungary fell to the Turks in the 16th century. Is it possible that the Ottomans invaded – and stayed for 150 years – because they were attracted by the abundance of thermal water?! Some of the Turkish baths they built during their occupation – including those in Eger, and the Rác and Rudas in Budapest – are still functioning today. The Baths and Wellness Centre at Gyula is situated in the mature grounds of a stately home, next to Hungary’s only medieval brick-built castle. Many country mansions have been restored and converted into luxury hotels, and the best of these offer a range of modern health-related services and facilities. Guests staying at the country-house hotels in Parádsasvár,Röjtökmuzsaj, Hőgyész and Bikal can expect to be treated like royalty! So beautiful is Budapest that several areas of the city have been declared UNESCO World Heritage Sites – including the romantic Danube riverscape and the Parisian boulevard of Andrássy út. Over 100 of Hungary’s mineral springs emerge in Budapest, and half of these feed the city’s thermal baths. Two of the grandest bathing complexes – the Széchenyi and the Gellért– date from the turn of the 20th century, when many large-scale architectural projects were commissioned to celebrate the 1,000th anniversary of the Magyar Conquest. 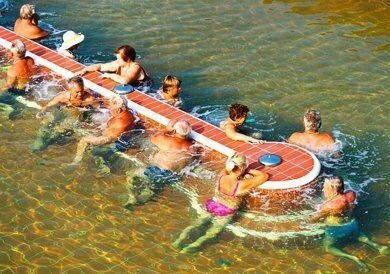 The largest thermal lake in the world that is suitable for bathing is located at Hévíz, in western Hungary. The water temperature never drop below 79°F/26°C – even in the depths of winter – and the lake is surrounded by hotels and sanatoria. Miskolctapolca, in the northeast of the country, boasts a unique cave lake. Situated on a geological fault line on the edge of the Bükk Hills, it is the site of both cold karst- and hot-water springs. There is also a new spa hotel at Egerszalók; the steaming terraces of snow-white calcium crystals on the green hillside are a spectacle to behold.